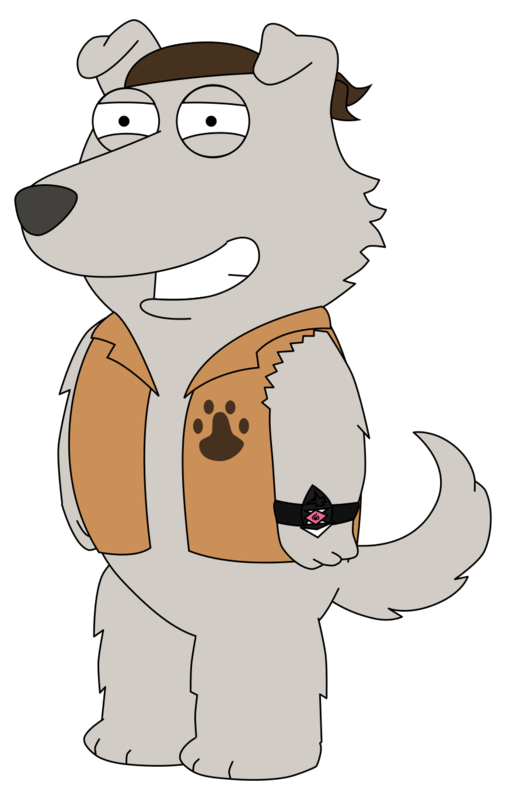 Here is Family Guy character New Brian as he appears in my upcoming fan series crossover with Pokémon, Family Guy + Pokémon: Dragon Tamers (which combines elements from Digimon Adventure 02 and Digimon Tamers). Instead of usually wearing his neckerchief (which he gave Brian), he wears a sleeveless jacket with a pawprint on it, and a brown headband. The Z-Power Ring he has on his left wrist bears the Z-Crest of Kindness. I'll have him wearing a bodysuit that matches his neckerchief later on, as well as him wearing Kommo-o armor. Note: New Brian is copyright of Seth MacFarlane, FOX and The Walt Disney Company as is Family Guy. The Z-Power Ring is copyright of Satoshi Tajiri, Ken Sugimori, Game Freak and Nintendo as is Pokémon. Digimon is copyright of Akiyoshi Hongo (a group comprised of Akihiro Yokoi, Aki Maita and Takeichi Hongo, the creators of Tamagochi) and Toei Animation.